I am not setting out to become the pro-vax parenting blogger. For one thing, I try to keep things light around here, for another, there are plenty of bloggers out there doing a better job than me. Besides, I’ve only written one post about it! But with the recent Onion article that caused an uproar on my Facebook page, and the measles outbreak at Disney World all over the news, it’s hard not to have an opinion. So now I’ve made an image too. 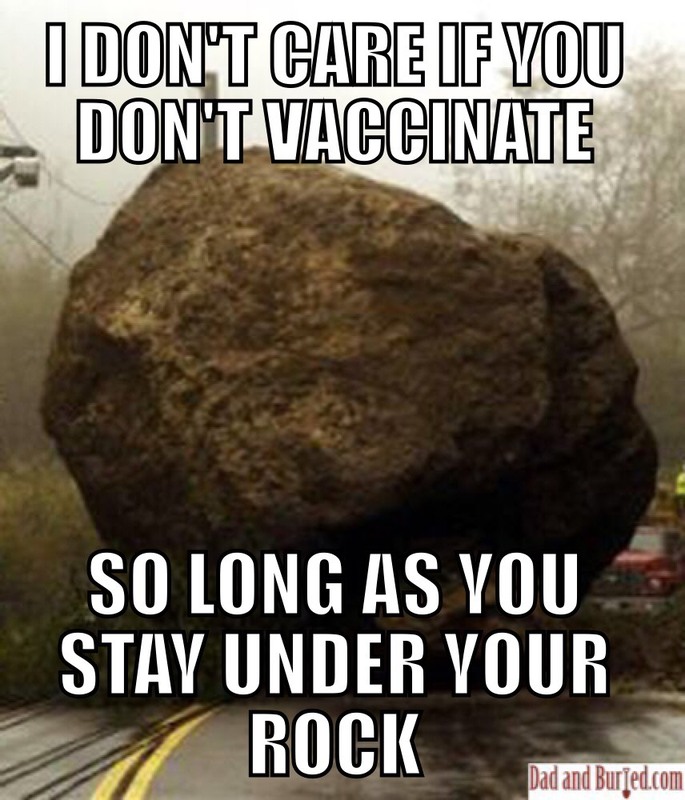 Obviously, if there’s a legitimate reason your kid can’t be vaccinated, then you have no choice. Like this dad, who’s as fed up with the anti-vaxxers as the rest of us. But if you do have a choice? Face the vax: it’s not only about you! It really shouldn’t be a choice anymore. Unless you can’t vaccinate your children, you must vaccinate your children. Or you can completely opt out of society. Which should be easy enough, because if you refuse to vaccinate, you basically already have. I’m with you. Too many self-righteous parents with too much time on their hands spout off pseudo-science and quote celebrities (with no education) asserting their “right” to do whatever the damn well please. With the exception of the rare case when a kid can’t be vaccinated, it shouldn’t even be an option. I’m totally with you. I’m a naturopathic physician and I do vaccinations in my office. While I support thoughtful decisions, I don’t support fear and panic. When I have parents come in choosing not to vaccinate, we talk about it. Frequently (if for no other reason than I tell them often that I need to chart their refusal at every visit). I am fine with people choosing what and when and how, but I hate the panicky calls when parents of unvaccinated kids suddenly realize there is a real disease out there and they desperately want their kid vaccinated. Now. At 8 pm. If you are both afraid of the vaccination and afraid of the disease and are thus paralyzed into indecision, I have FAILED to do my job correctly. If I can educate people into feeling safe and comfortable with their choices and the possible outcomes, we all win. People need to understand the science and the risks (of all medications, dammit, and the diseases) and then need to make choices through education, not fear.